When I was 43, my wife and I sold our house, bought a motorhome, quit our jobs, left home (Alabama) and wandered for five months ending up in California. That was our first experience with retirement and full-timing, and the trip was the topic of my first book, Retire and Travel for $1000 a Month. Since then, I've traveled well over 100,000 miles in RVs and am still anxious to go some more. 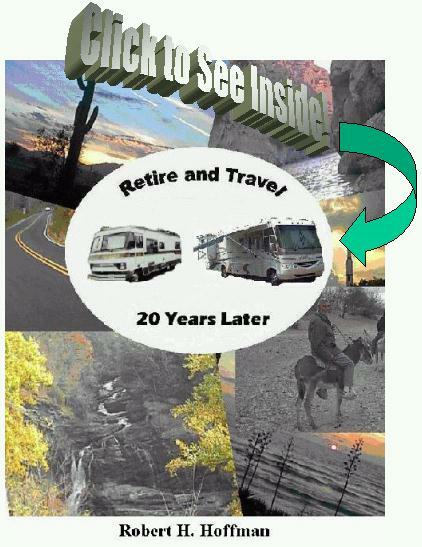 We've been in and out of both retirement and full-timing multiple times, I've produced a popular website on both topics, I've read the writings of several other experts on the topics, I've talked to many other RVers, and I've learned enough about both to write this book. In this new book, I'll try to make you laugh a little, learn a little, and go away with the thought that RVing is a viable alternative for you in your retirement, either as a full-timer or a part-timer. I've tried to create a mixture of entertaining, as well as informational chapters. Your home away from home, or new motorhome, can feel like home with a scented candle or even opening the windows and letting in the fresh mountain air. 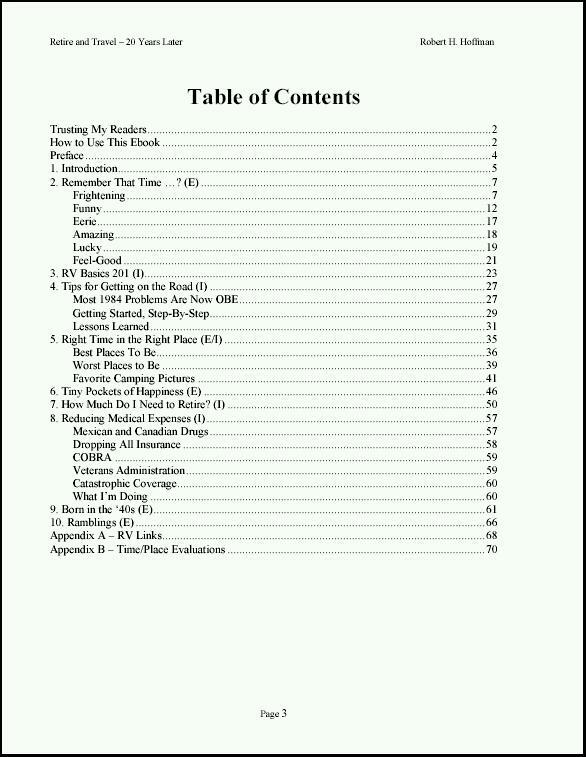 In the Table of Contents below, you'll note that the chapters are marked with E if they're Entertaining and I if they're Informational. If you'll click to see inside, you'll find excerpts from some of the chapters. Scroll down this page to read a synopsis of the book. I kick off the book with a series of anecdotes from Frightening to Funny to Feel-Good, of events that have happened during our 20 years of RVing. The two chapters on RV Basics and Tips for Getting on the Road reflect on advice from the first book, then provide steps to getting started on the road and some of our 20 years of lessons learned. I then include a chapter on the best and worst camping spots that I've found, followed by some very entertaining impressions of an RV non-enthusiast (my wife, Joyce) and her Tiny Pockets of Happiness. Chapters 7 and 8 address the cost of retirement, with some suggestions on how to determine what you require and how to save money on your medical expenses. I wrap-up with two somewhat philosophical chapters on how great it is to be part of the Silent Generation, then some of my Ramblings on RVing in general. The appendices contain some details that may be of interest, with links to all sorts of RV websites, and spreadsheets with data to support my best/worst camping conclusions in Chapter 5.